In today’s post we’re going to talk about what is possibly the most efficient tool that we use on our websites to lead users to perform a certain action on our website: landing pages. Whenever we want our visitors to go somewhere (e.g. view or buy one of our products, or sign up to our newsletter, or read our blog), we can create a so-called “landing page”, which is nothing else than a page that is designed for that specific purpose. There’s no limit to how many landing pages you can have on your site, and in many cases it’s preferable to link to those pages instead of the main home page of the website, especially on social media, effectively becoming primary entry points to your website. In other cases, for example if you’re building a website for a product/event that’s not yet ready/launched, the entire website can be composed of just one landing page. WordPress is just great at managing content, and landing pages make no exception. In the event that your website is only composed of one page, create a new page and set it as the “Static Front Page” of your website from your “Reading” settings in the WordPress admin. Right, but how can I create a successful landing page in WordPress? 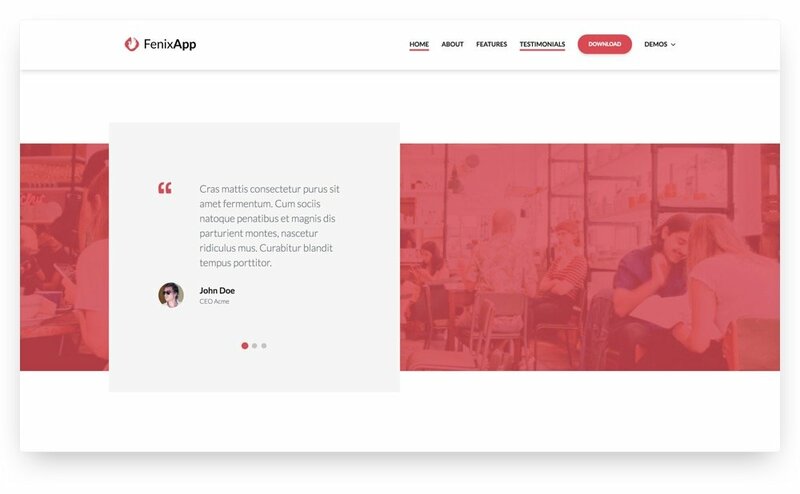 Well, let us take you through 4 useful steps to do it using WordPress and our own tools: our flagship theme Fenix, and our premium page builder plugin Brix that is included in the theme. It all starts selecting the right instruments for the job: sure, you could design and code the page from scratch, but why not take advantage of one of the great page composers out there to get a headstart? If paired with a theme that fully supports them, page builders are just great to create great looking pages in virtually no time, and be able to maintain them after they went live. This is where Brix and Fenix come in. While they can both exist on their own, they really complete each other, giving you the best of the two worlds: outstanding flexibility when editing your content, and awesome stylistic display. Need a reference for that? 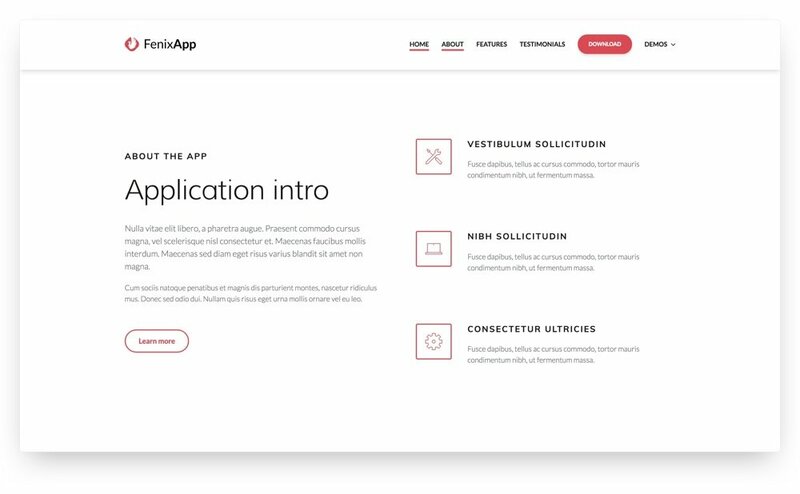 Take a look at our App demo (included in Fenix, with one-click install) and see for yourself. Regardless of the builder/theme pairing of your choice, the golden rule to follow when composing your page is to invest time in writing great copy for the purpose, and perhaps insert some testimonials that vouch for the quality of your product/service. Hey, Fenix has a “testimonial” builder block just for that purpose, but you could have easily used a quote block for it, since they’re perfectly styled as well: ain’t that handy? Just like that song you hear in the morning on the radio that somehow sticks with you all day long, landing pages need to be memorable and effective. That’s why you need to wink at big content sections, with wide images and generous spacing to surround your content. Page builders, and Brix specifically, really do a great job at managing those situations: you can set up your content sections how you prefer, including backgrounds, colors and spacing, and change your mind about them completely down the road, should a new awesome idea pop in your brain. So we’ve come to the pragmatic part of building your page, and we’re going to list the absolute best practices that come into play when designing your landing pages. Make it snappy and choose a theme that is fast at loading and supports optimization and caching plugins. We’ve conceived Fenix with those tasks in mind right from the start, so why not give it a spin? Make your message clear and succint and your call-to-actions well visible: ideally this stuff goes above the fold, that is the area of the website that your visitors see the moment they open it. Use space and visual clues to point the look of your visitors to the primary action button, so be generous with margins, let your text breathe and choose your images wisely. Recent researches indicate that visual content can lead much better to conversion, so why don’t you consider inserting a video in your page? As explained before, try to gain the trust of the visitor: use testimonials for that purpose, and, in case you’re selling a product or service, provide a guarantee to reduce the risk of losing the visitor attention. Use the right tools and consider other popular plugins such as OptinMonster for lead generation, and Mailchimp and its cheaper alternative MailerLite for email marketing and automation. No landing page can be ever defined as “complete”, but instead they rather are constant works in progress. As such, they need to be modified after they’re published, and since we’re in this to generate conversion, we better do it right: that’s why you need to keep track of how your page is doing. In order to do this, make sure to select a theme that is solid enough to support tools such as Google Tag Manager to keep track of who’s visiting your page and where they come from. And while you’re there, maybe go a little deeper and track what your visitors are doing on the page, using tools like Hotjar or the free plugin heatmap for WordPress. Hey, you may even want to do some A/B testing on your page, but that’s a topic for another article. Did you find this post helpful? Write down in the comments what are the things you do when creating your landing pages, and don’t miss out on new content from us by keeping an eye on our blog and following us on Facebook or Twitter.